Countless cancer patients call The Journey Program “life-changing.” Currently provided in three Northern Michigan locations, the free 10-week program bridges the gap between treatment and recovery. And soon, some Journey Program classes will be available to cancer patients anywhere in Michigan, the United States, and even the world—thanks to their downloadable exercise videos. Founded in 2009, Jean Mahoney and Annemarie Wigton recognized that every cancer patient’s journey is different. 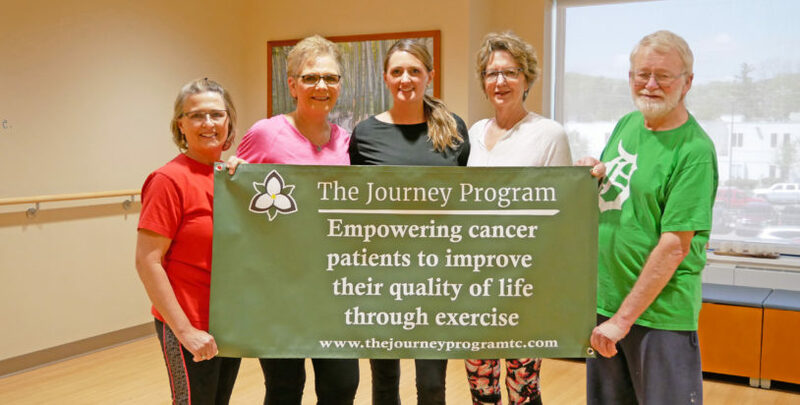 Wanting to help these patients along the way, they formed The Journey Program, with tailored exercise classes specifically designed for cancer patients on their paths to survivorship. Through strength training, cardiovascular training, core, balance, and chest-opening exercises, patients build their confidence back up and become independent with exercise. When patients complete the 10-week program—which is free to patients thanks to the generosity of sponsors—they’re not only physically stronger but mentally stronger as well. “In Traverse City, Frankfort, and Suttons Bay we offer the free 10-week class to increase strength and stamina so patients can return to work and their daily activities,” Annemarie says. “Plus at the Cowell Family Cancer Center, we offer drop-in beginner exercise classes. For $10 a video, cancer patients can download two different exercise concentrations—core and posture—with exercise instruction led by Annemarie, who is a Certified Cancer Exercise Specialist and NSCA-Certified Personal Trainer. “The core exercises are gentle and can even be done in bed while people are recovering,” Annemarie says. “The main focus is for them to reconnect with their body post surgery or treatment. How should movement look? How should it feel? We want individuals to regain their confidence. To download the cancer exercise videos, become a sponsor, or if you’d like to bring the program to your location, visit thejourneyprogramtc.com.